The most obvious problem almost everyone has seen is the failure of gold decorated bone china in the oven. This is because conducting metals arc and spark. Notwithstanding this, any non-porcelain has a certain percentage of iron in the clay. Iron red stonewares, for example, can contain 4-5% iron. However this metal is not in the metallic form, it exists as part of the silica crystal matrix of the ceramic. Notwithstanding this, bodies of higher iron content do heat up so common sense is needed. Of course body materials containing particles of pure metal (for specking) would be bad. Glazes also are an issue. Those of of high iron oxide content (or other metal oxide) will clearly be an issue (e.g. tenmokus). However ware exposed to the micro waves can also super-heat it for another reason. Ceramic bodies often fire with porosity, especially earthenwares and high temperature iron reds. These porous bodies that can absorb water into the matrix. Obviously this water is going to turn into steam inside the clay matrix. That steam will either super-heat the body or the pressure will fracture it. This is an obvious danger in the microwave, especially where the ceramic is glazed preventing quick water escape (crazed glazes, bare patches or unglazed footrings can also provide entry channels for gradual water logging of a piece). A common sense issue is cross section of the ware. If it is uneven (very thin in some places and thick in others) then the warming food in the container will heat it unevenly resulting in possible cracking. Simple common sense and testing should suffice to prove the microwave suitability of a ceramic. To test, just put a little water in a piece and try it in a microwave for 30 seconds, if it feels a lot hotter than the water then there is a problem. If that is OK, try it for a minute. 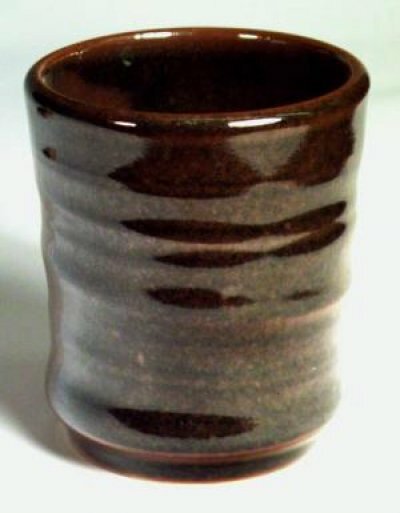 The cone 6 glaze is well developed, it is not crazed. But the clay underneath is not developed, not vitreous. This crack happened when the mug was bumped (because of poor strength). It is barely visible. 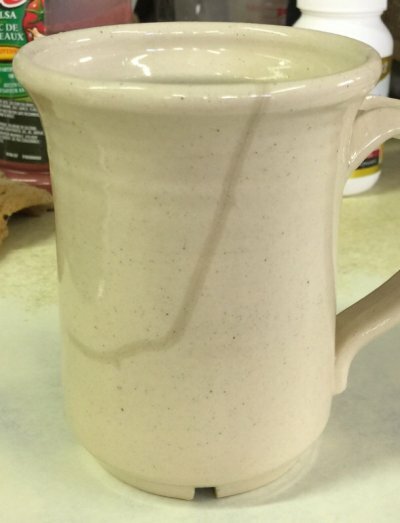 When the mug is filled with water, this happens. How fast? This picture was taken about 5 seconds later. If this was crazing, and this piece was in actual use, the clay would gradually become completely water logged. Then one day someone would put it in the microwave! Boom. Fired on a porcelain in a gas kiln. (Articles) Is Your Fired Ware Safe? Glazed ware can be a safety hazard to end users because it may leach metals into food and drink, it could harbor bacteria and it could flake of in knife-edged pieces.